Home | Visitors Guide | The I amsterdam City Card – worth it! The I amsterdam City Card – worth it! The I amsterdam City Card (yes, with a lower letter ‘a’) is a pass that provides free or discounted access to 44 of the city’s museums and attractions. Among others, this includes the Van Gogh Museum (where your free entrance comes with a skip-the-line time slot) and the Rijksmuseum. The one-, two-, three or four day pass also allows you to freely travel on Amsterdam’s excellent public transport system. Also included is a free canal boat tour – Amsterdam’s most popular tourist attraction. The card also includes discounts at restaurants and cafés. Want to ride a bike or explore the canals by boat on a discount? Bring along your card. The pass costs €60,00 (24 hours), €80,00 (48 hours), €95,00 (72 hours), €105,00 (96 hours), or €120,00 respectively. Amsterdam Marketing estimates that the card will save you a significant amount of money. These potential savings are based on visiting 3 attractions a day plus public transport. You may actually save more if you also take advantage of the card’s additional benefits — such as the free canal cruise, and discounts on concerts, theater, rentals, restaurants and more. Will you save money with the I amsterdam city card? How much money the card will save you depends on how many of its benefits you will realistically use. But over 93% of those who have purchased the card have indicated their satisfaction. Customers usually highlight both the savings (“Good value for the money”) and the convenience of the pass (Read the reviews). Note that without the I amsterdam city card a canal cruise can easily set you back €11-16. Expect to pay similar rates for a bike rental. A visit to one of the top museums normally costs about €19.00. Add the cost of public transport (and, face it, the hassle of figuring out its ticket system) and you’ll that it’s a good idea to get yourself a city card. You still have to wait in line to enter each museum and attraction. The only exception is the Van Gogh Museum. In general, you’ll want to get a multiple-day I amsterdam city card in order to get the most out of it. After all, you may want to visit the Rijksmuseum, the Van Gogh Museum, the Anne Frank House and the Zaansche Schans (an open air museum 45 minutes by bus north of Amsterdam) all within one day while taking a canal cruise in between, but you’d have to be crazy to try and do so. In evaluating whether or not you would save money with the I Amsterdam City Card you have to plan ahead. What do you absolutely want to see and do? Does the card provide a significant benefit? Older guidebooks may talk about the I amsterdam card, or the I amsterdam pass instead of the current name. Don’t be distracted by the sheer volume of discounts and other benefits on offer. Focus on the attractions you would visit even if the card did not exist. How many days will you spend in Amsterdam? The card is valid for 1, 2, 3, 4, or 5 days (24 hours, 48 hours, 72 hours, 96 hours, or 120 hours). The card may be useful to you even if you plan on staying more than 4 days — as long as you can schedule visits to the attractions of your choice within the specified amount of time. Note: the museum feature of the card is activated the moment you visit your first museum. The public transport element of the card is activated the moment you first use a tram, bus or metro. Hence, if you purchase (or pick up) your card at the Visitor Information Centre at Amsterdam Airport Schiphol you may not want to activate it right away if you expect to get more use out of it once you’re ready to explore the city. You’ll also get 25% discount on performances at Boom Chicago, Royal Concertgebouw, Muziekgebouw aan ’t IJ, Dutch National Opera & Ballet and more. If you plan to visit any of these venues, that’s a good deal. 25% discount at MacBike – Bike Rental, Canal Bike & Canal Bus and boat rental. Nice, but keep the seasons — and Amsterdam’s fickle weather — in mind. You may not want to ride a bike, certainly not a canal bike, in mid-winter. The hop-on, hop-off Canal Bus is a nice way to get around the city, especially in combination with visits to several of the major museums. But how many museums can you stand in one day? 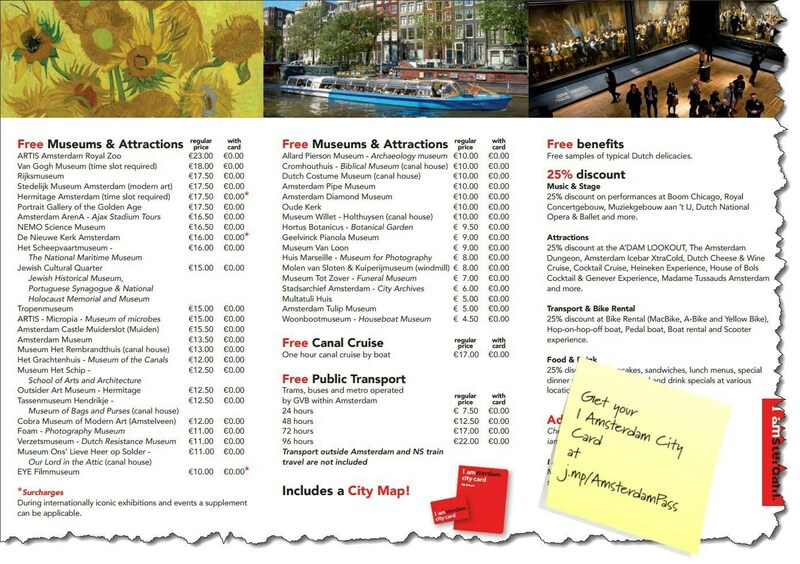 A few of the attractions to which the card provides free of discounted access are outside Amsterdam proper. You may not want to combine, say, a museum visit in Amsterdam with a excursion to a town or village in Greater Amsterdam. The free public transport element of the card is valuable. Normally, a single, 1-hour trip costs €3,20. But if you end up using the card primarily for travel on buses, trams and metros, there are better options: Day tickets are available as well: 1 day, €8,00; 2 days, €13,50; 3 days, €19,00; 4 days, €24,50. (Tickets for up to 7 days are available). Mind you: Amsterdam is rather small, and many tourists do not spend much time on public transport. GVB is the main provider of public transport within Amsterdam. The card does not entitle you to travel on buses operated by Connexxion or EBS, but that’s no big deal. You won’t see many of these regional buses anyway, and their few routes in the city merely duplicate those of GVB buses, trams, and metro. The card does not provide access to the trains. Hence if you happen to purchase the pass at Schiphol Airport (Arrivals 2), you can only use it on Bus 69, which takes your to Sloterdijk Train Station, where you have to transfer to Bus 48 in order to reach Central Station. That’s simply not worth it — especially since you will then have activated the public transport portion of your card before you’ve even seen your hotel. The many benefits of the I amsterdam city card: free entrance to museums, free canal cruise, free public transport, lots of discounts, and much more. Tourist Office (‘I amsterdam Visitor Centre’) across from Central Station.